Pakistan says they've become the first to use a satellite for multi-spectral imagery for crop-mapping. A satellite passing over Pakistan once a week, will give 13-color imagery to help identify crop data, including seed quality, growth, disease, the area of cultivation, yield, impact on the economy and determine export potential of excess crop. The technology will help determine the type and health of crops, moisture in soil and to predict the quantum of production. 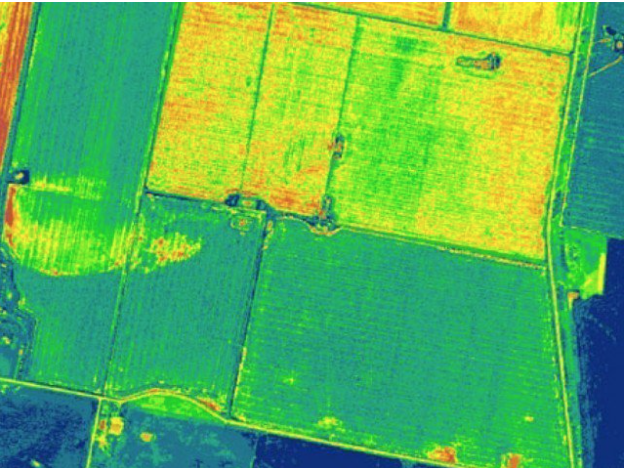 Pakistan has become the first country in the world to use multi-spectral imagery for crop-mapping with a 10-meter resolution and remote sensing through a UK satellite called Sentinel-2 A. The purpose is to determine the kind of crops, their health and the moisture in the soil to predict the quantum of production. Information Technology University (ITU) founding Vice Chancellor and Punjab Information Technology Board (PITB) Chairman Dr.. Umar Saif said during an interview with a private television channel on his project “Food@Home” on Friday. Dr Saif said there was no dependency on anyone for crop mapping as was the case in the past. He said that previously, people would use android phones to report the GPS location through which Google provided a three-metre resolution in black. On the other hand, Sentinel-2 A, which passes over Pakistan once a week, will give 13-colour imagery to help identify crop data, including seed quality, growth, disease, the area of cultivation, yield, impact on the economy and determine export potential of excess crop,” he said. “After two years of research and development, we are launching Punjab’s agriculture crop maps, generated automatically using machine learning on multi-spectral satellite imagery. The system gives weekly data about the yield of 26 crops across Punjab. We were making our maps freely available, which could be accessed by installing the machine-learning algorithms on your computer,” he asserted. Dr. Saif said the digitalized data would help in market facilitation, stability, direct interest-free loans to small farmers from banks and subsidy without involving middleman. Other users such as government to formulate agriculture policy, insurance companies, agriculture departments and industry could benefit from the data gathered in real time.